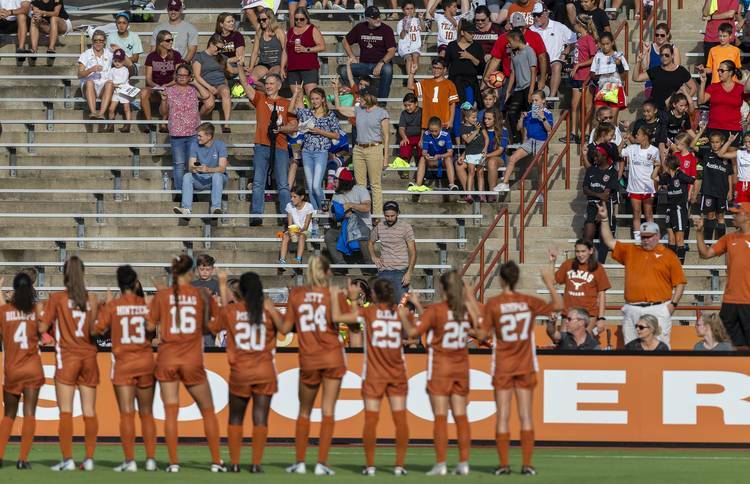 The NCAA added another home game to Texas’ soccer schedule on Monday. The Longhorns will welcome Virginia Tech to town for the first round of the NCAA tournament, the NCAA announced. The winner of that tussle will meet either Arkansas or Little Rock. The second and third rounds in UT’s section of the bracket will likely be hosted by North Carolina, which scooped up one of the tournament’s four No. 1 seeds. Texas (13-4-3) and Virginia Tech (9-7-3) will play Friday at 7 p.m. The Longhorns are 10-0 at Myers Stadium this season. In its last match, Texas was beaten by West Virginia in the semifinals of the Big 12 tournament. Three of the team’s 13 wins, though, have been recorded against postseason participants Long Beach State, Baylor and Kansas. The Longhorns also tied a match that was played at North Carolina (17-3-1) in August. The Longhorns have scored 39 goals, the program’s best effort since a 48-goal season in 2007. Junior forward Cyera Hintzen, the program’s first-ever Big 12 offensive player of the year, leads the conference in goals (10), assists (nine) and points (29). Alexa Adams, Haley Berg and Katie Glenn have each scored at least five times. Junior goalkeeper Nicole Curry had a school-record 11 shutouts last year, and she has since added six more this season. Texas has gone through stretches without starters Julia Grosso and Emma Regan, who missed six conference games while playing with the Canadian national team. Grosso was still named the conference’s co-freshman of the year. Regan has been a key member of UT’s defense. Without the two Canadians, Texas went 3-2-1. The Longhorns are 2-2-1 since their return. Texas is making its 13th appearance in the NCAA tournament. Texas ousted North Texas and Clemson last year before succumbing to a Duke team that went on to reach the national semifinals. In its history, Texas has never advanced past the third round.